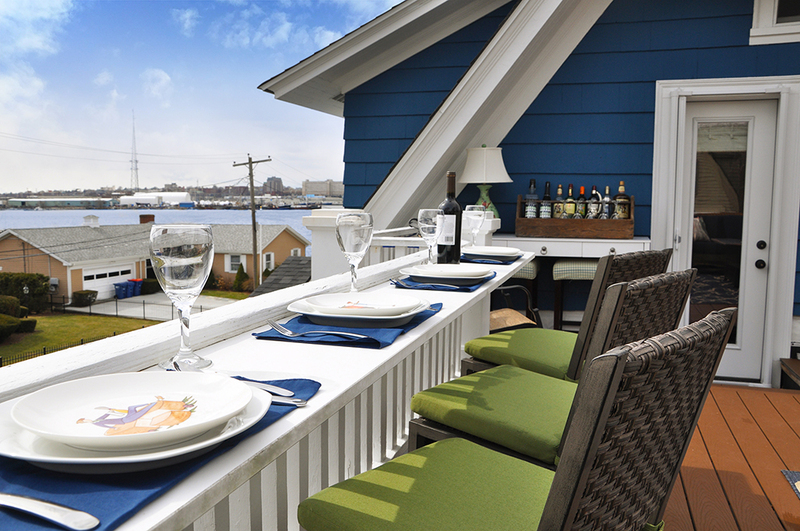 This 1927 clipped-gable dutch colonial was designed with decorative railings on the flanking roofs. Originally, these copper roof areas were never intended for use. 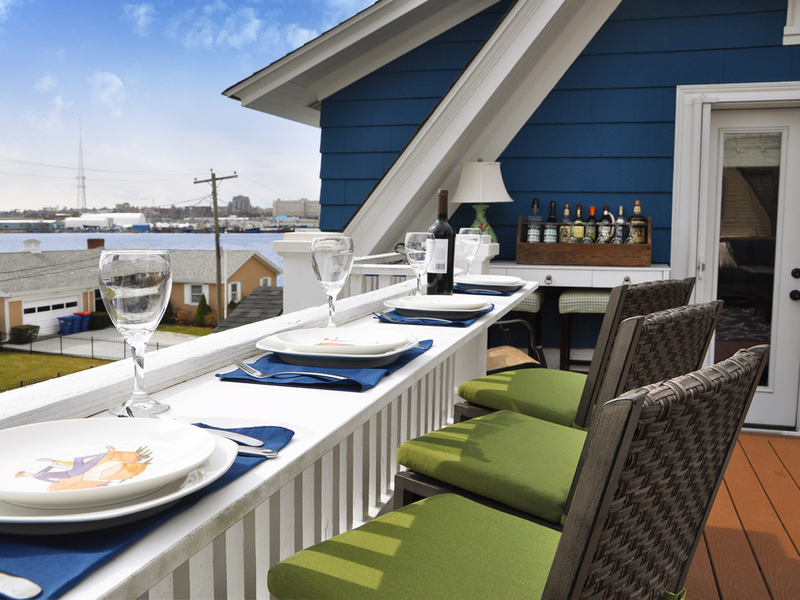 Since this property had spectacular water views, we would occasionally climb out the windows to capture a better look of the harbor. This quickly became the go to spot for Fourth of July fireworks! While climbing in and out of windows was fun the first few times, the cat burglar method was starting to get old. 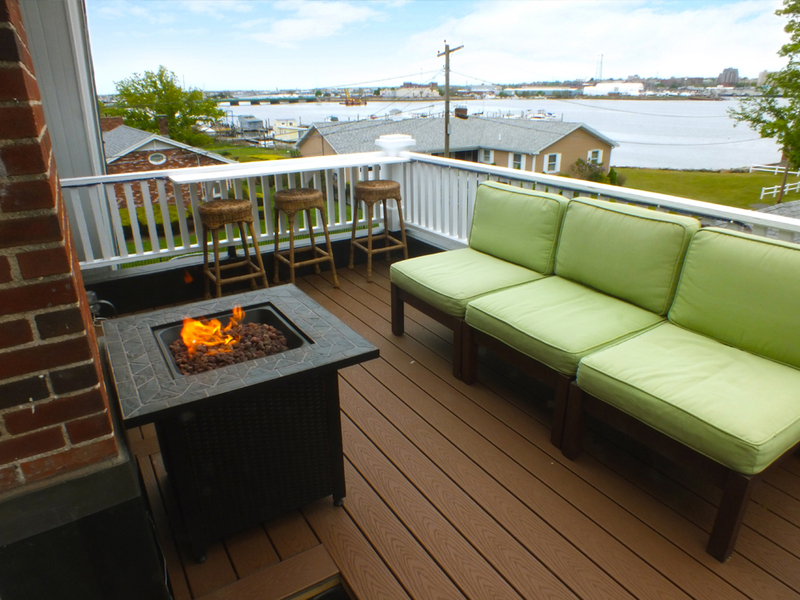 Our goal was to improve access and create a comfortable area to relax. Unfortunately, the height of the railings were insufficient to meet today’s building code for usability. 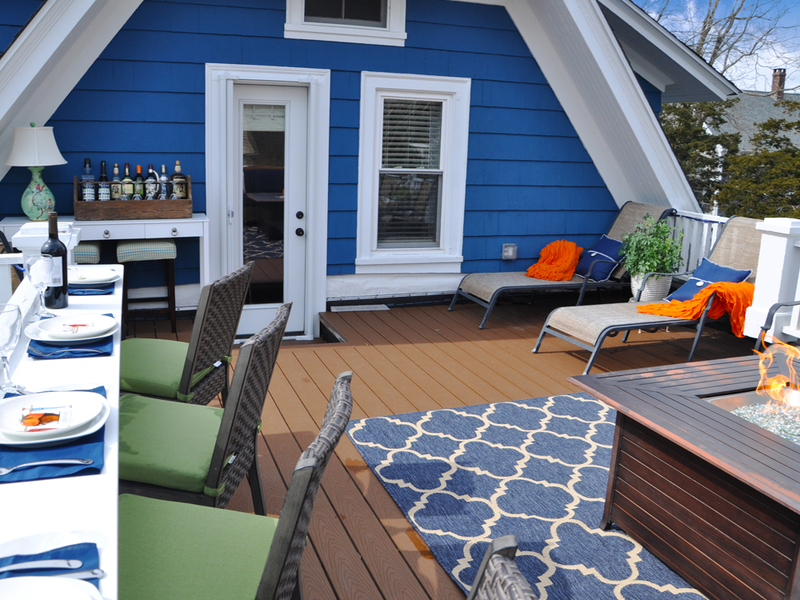 To make the space usable, without changing the home’s profile, the roof was dropped 10″ into the mansard roof. 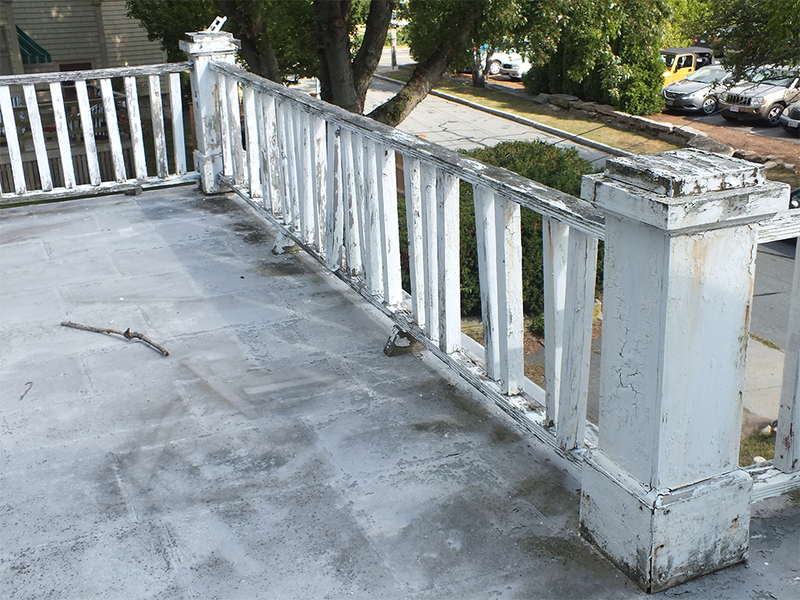 Years of neglect left the railings in serious disrepair. The rooftop was fortunately copper; unfortunately it was failed. It was recycled for a tidy sum! 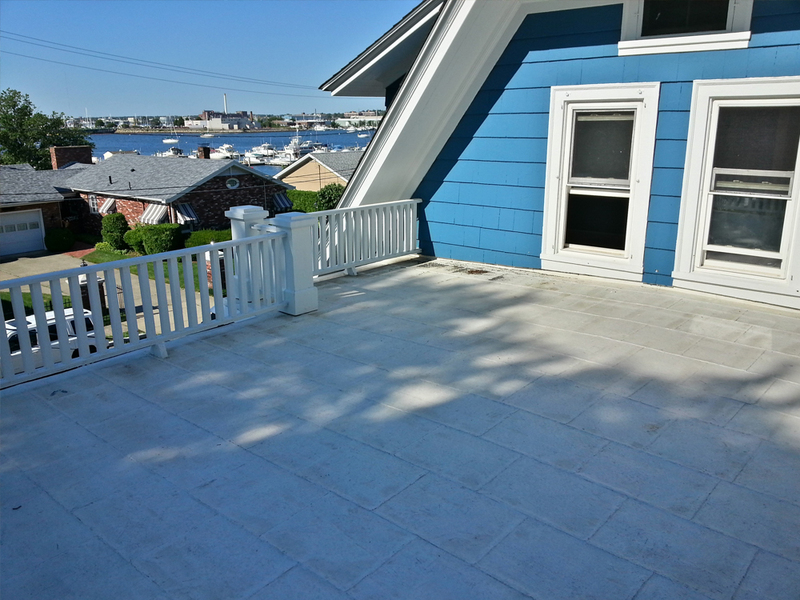 The roof needed to be lowered by 10″ in order to install a door and meet today’s building code for the railing height. Existing conditions were unknown until demolition began. Why the house was built with 3′ of wasted space and inaccessible roofs, is unknown! Luckily we didn’t find any critters (or dead bodies) hornets, however, were abundant! 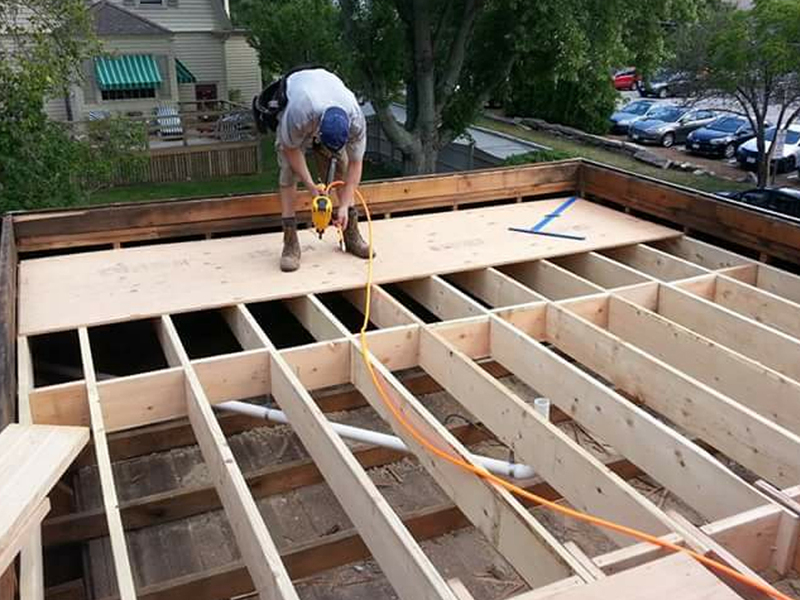 2 x 10 floor joists and 3/4″ plywood was installed 14″ below the original location of the roof to allow for roofing system and decking. 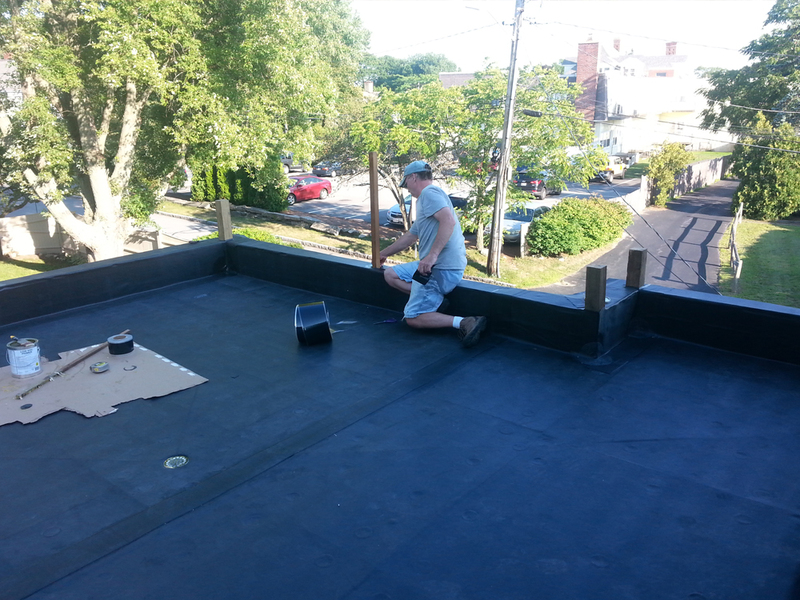 New rubber roof on 3/4″ plywood on 2×10 joists. 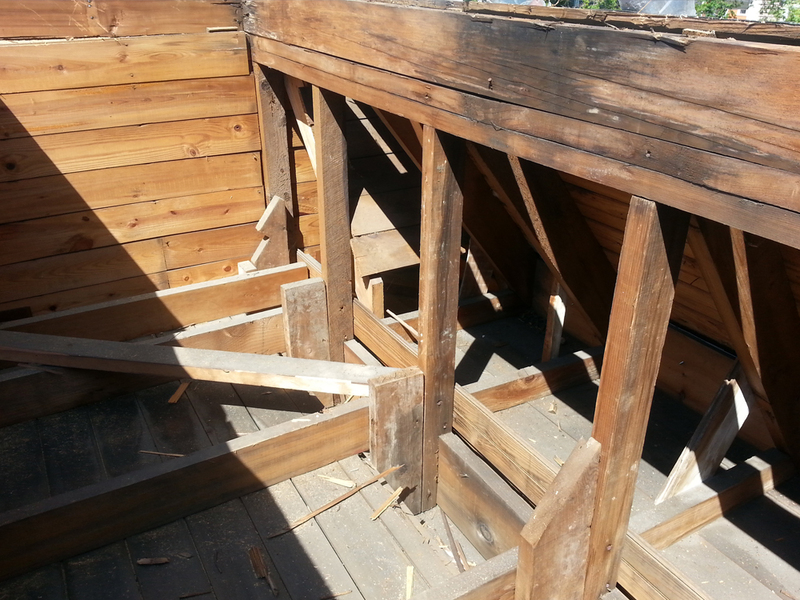 The old joists were salvaged for future projects, one being a new dining room table! Roof drains were installed in the main roof and also in the door depressions. From the street, the house looks exactly the same. Note the one unpainted post in the middle of the railing was required to be added to meet today’s code for lateral support. Many of the posts needed to be completely refurbished. 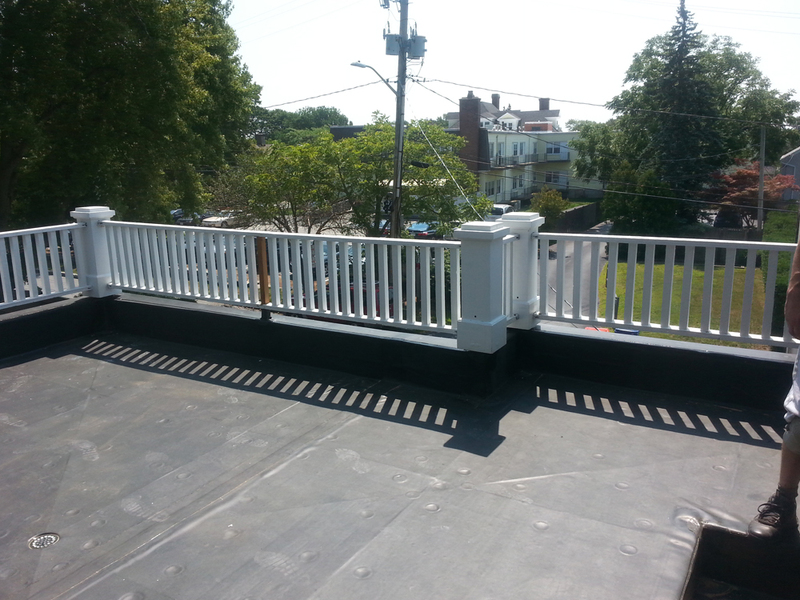 The lumber to replace the full 2″ x 2″ balusters came from an original work bench in the basement. 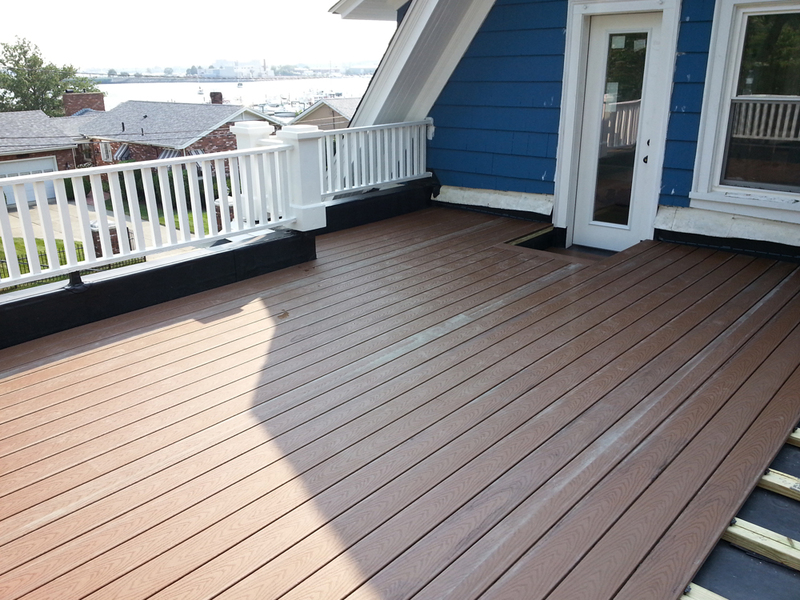 Composite decking on 2 x 4 PT sleepers with hidden fasteners. A Great Place to Dine! A nice lounge area when the fire department isn’t knocking on our door! They were called a couple of times because neighbors saw the flames and assumed the house was on fire. 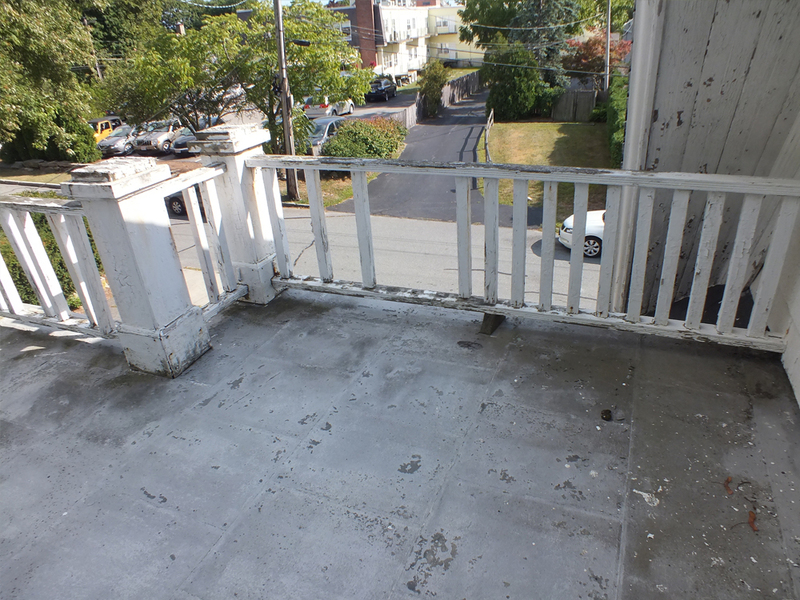 It does get a bit hot early in the day on the east balcony, but the west balcony is quite comfortable! A smaller balcony accessible from two of the bedrooms on the other side. 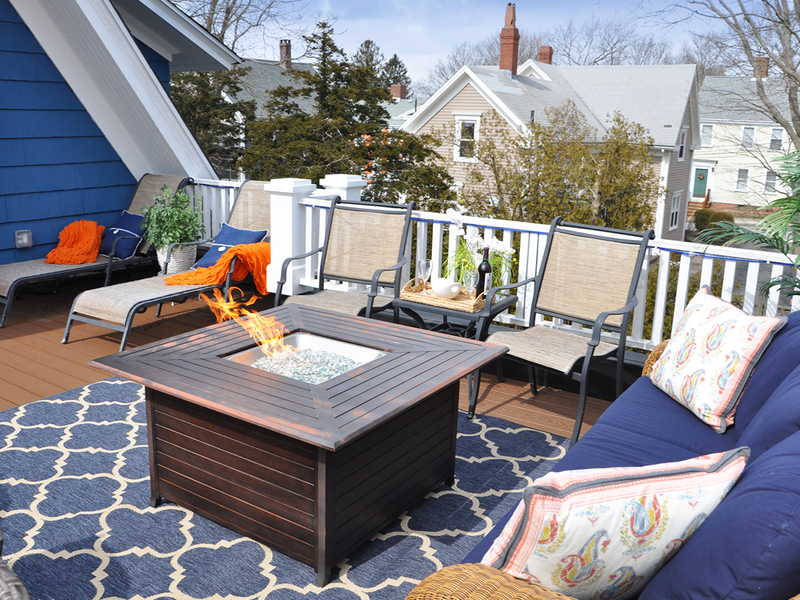 A great spot for a morning cup of coffee or a glass of wine at the end of the day!